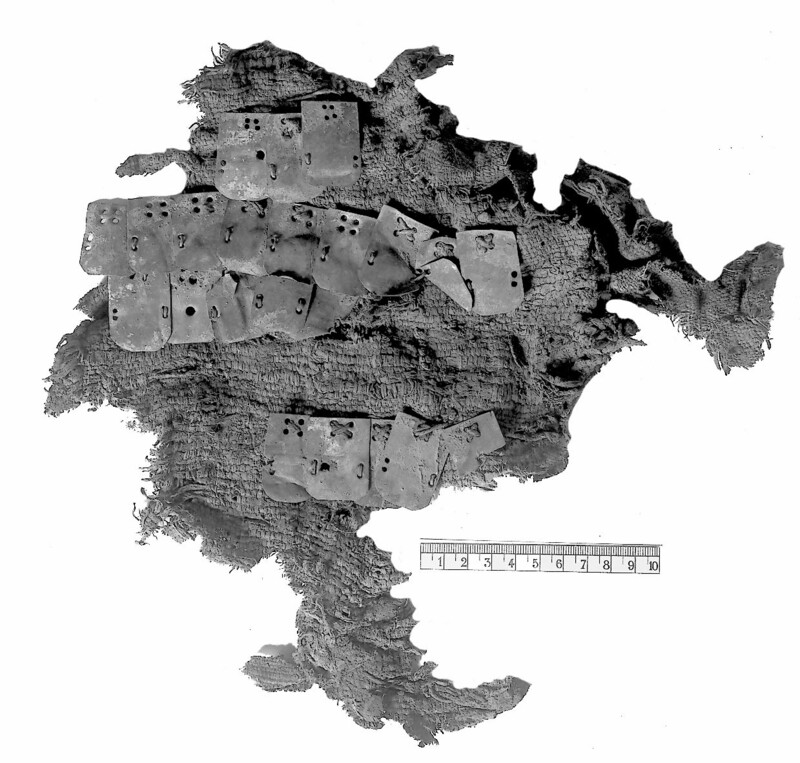 Photographs of metal artifacts from Dura Europos on display in the Yale Art Museum, plus photographs and notes on metal artifacts from record in the Yale University Art Gallery. archives. 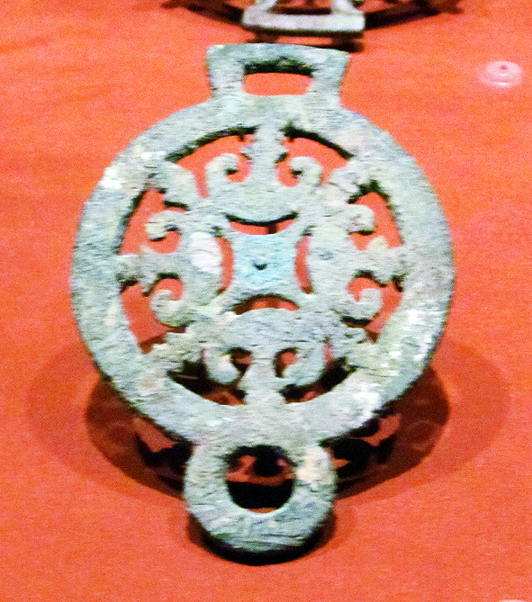 Bronze plaque ornamented with trumpet design. 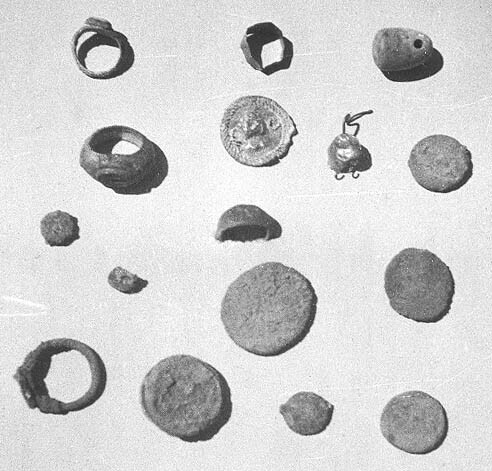 It may have fastened against a flat solid surface (Fisch and Toll 1949:Figure V.69). Length = 5.4 cm, width = 2.65 cm and thicknes = 4 mm. Reg. no. 1938.2163. 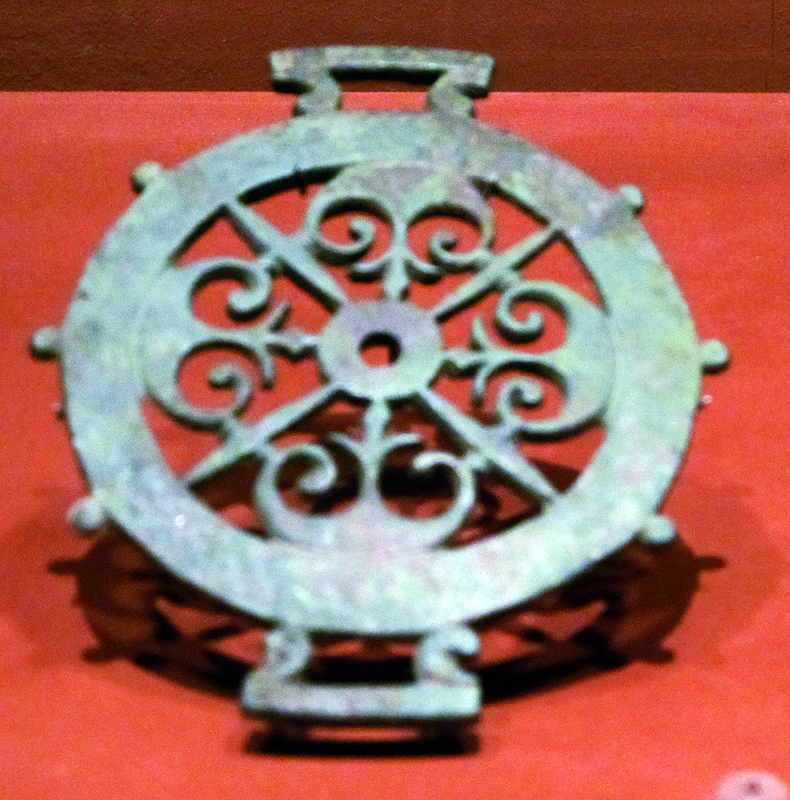 On display in the Yale Univerity Art Museum. 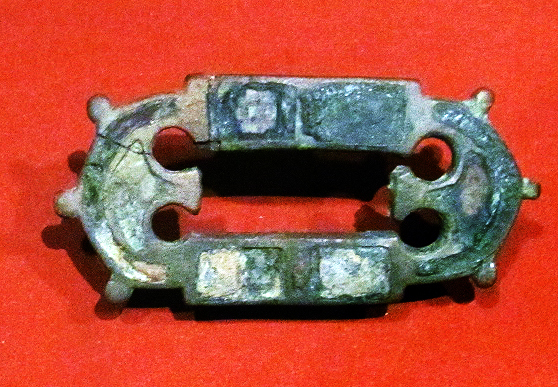 Enameled bronze strap ornamented with traces of white, red and cobalt blue enamel (Fisch and Toll 1949:42, Figure 9.31). Length = 8.6 cm, width = 4.05 cm and thickness = 2 to 2.5 mm. Reg. no. 1938.1412. On display in the Yale Univerity Art Museum. 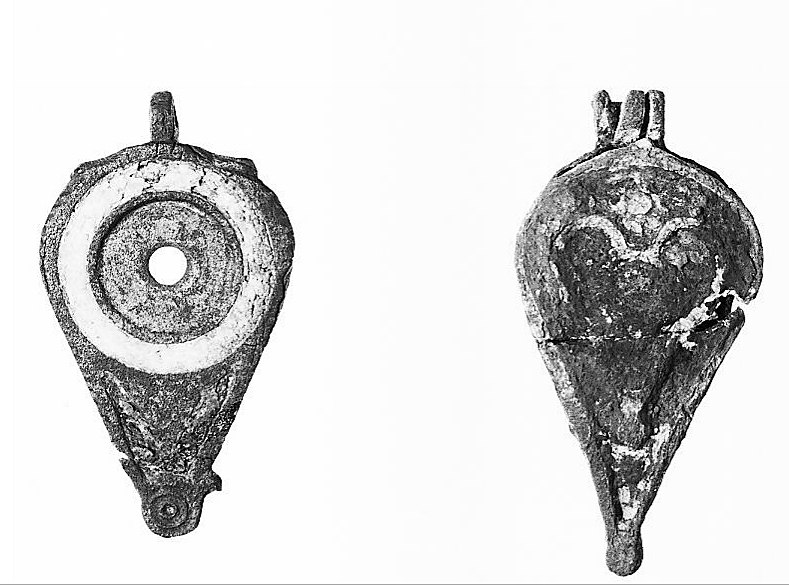 Bronze phalara ornamented with stylized trumpet design in whirligig arrangement from excavation unit J8 - W11 at Dura Europa (Fisch and Toll 1949:8, Figure 1.2). 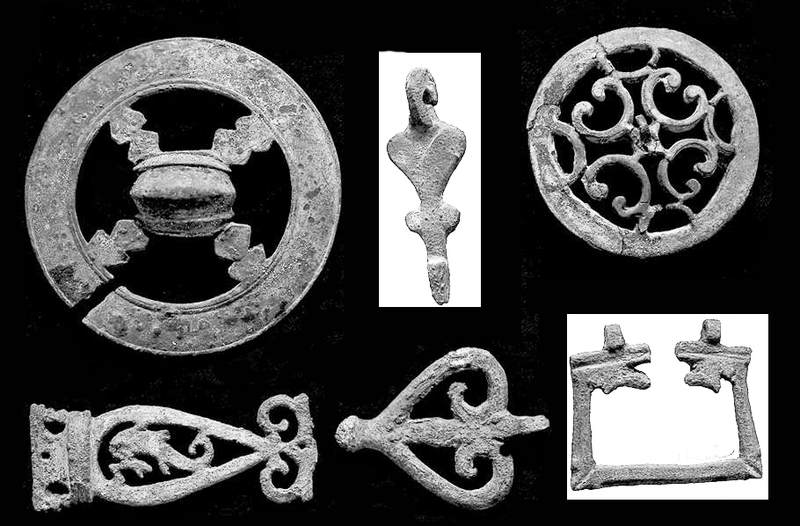 Diameter = 5.3 cm and thickness = 3 to 5 mm. Reg. no. 1938.2179. On display in the Yale Univerity Art Museum. 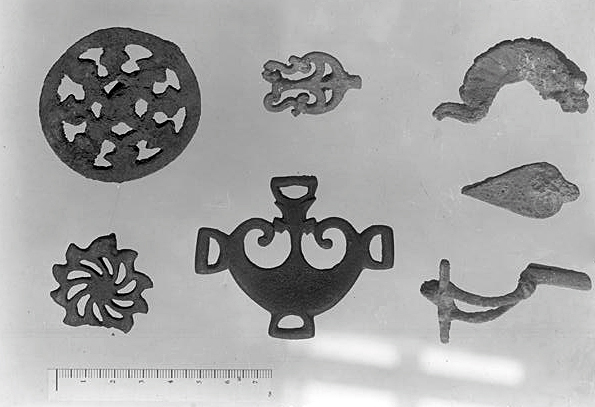 Bronze bridle piece with rosette design from excavation unit G1 - 36 at Dura Europa (Fisch and Toll 1949:12, Figure II.15). Length = 8.9 cm, width = 6.3 cm and thickness = 4 mm. Reg. no. 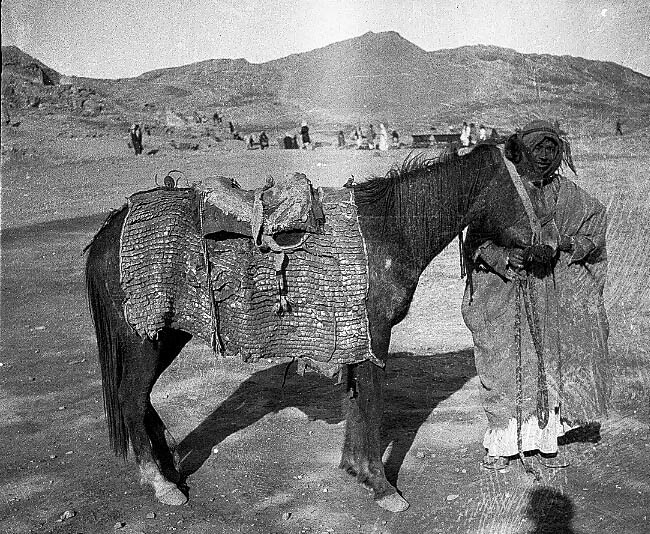 1932.1434. On display in the Yale Univerity Art Museum. 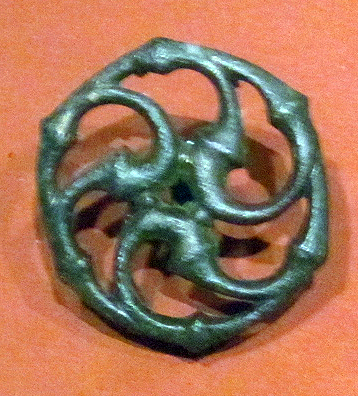 Bronze bridle piece with rosette design. 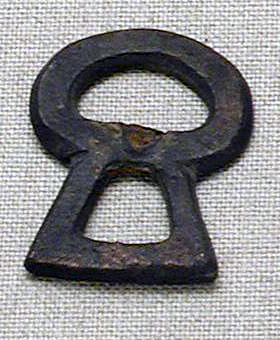 On display in the Yale Univerity Art Museum. 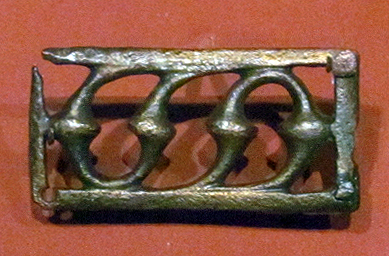 Bronze buckle. Reg. no. 1938.2085. 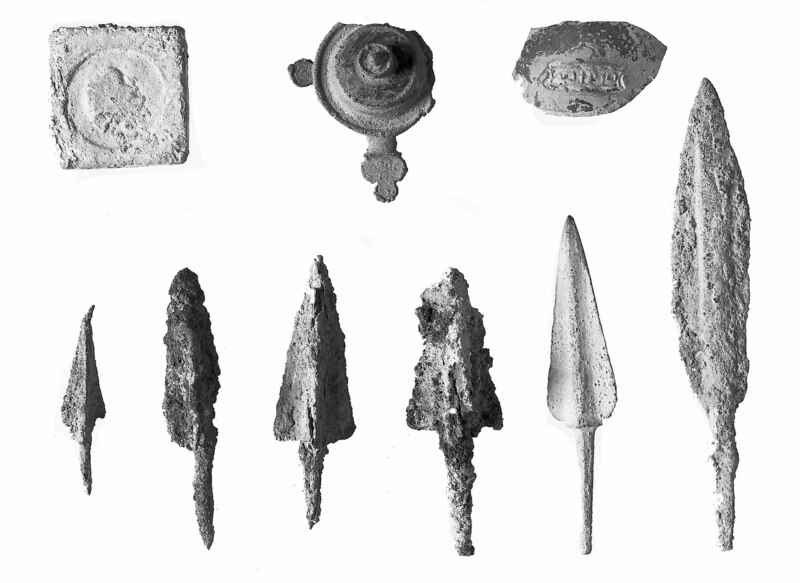 Metal artifacts from Dura Europos. 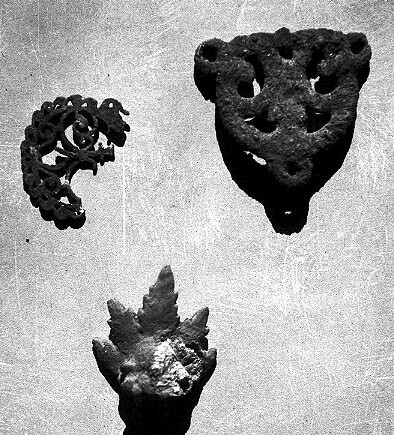 Armor of metal scales sewn onto leather with saw tooth skirt bottom. 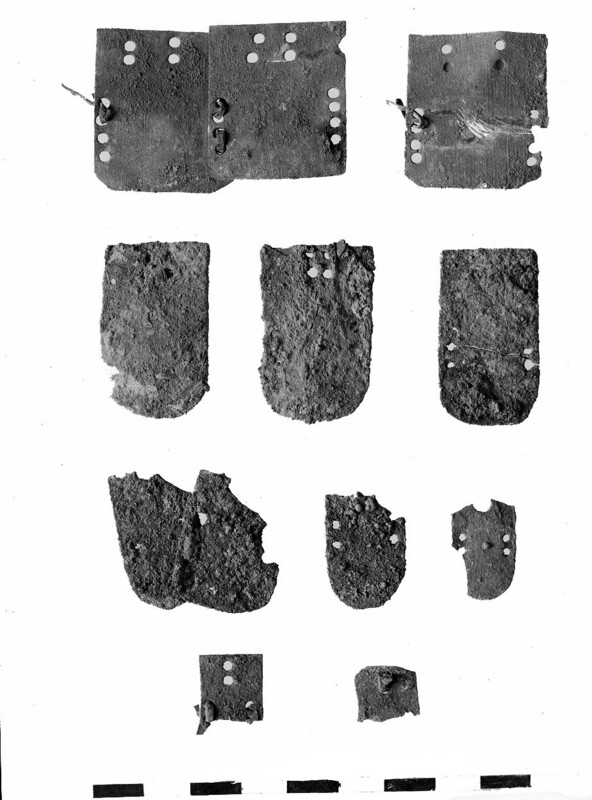 Armor of metal scales mounted on leather for a horse. 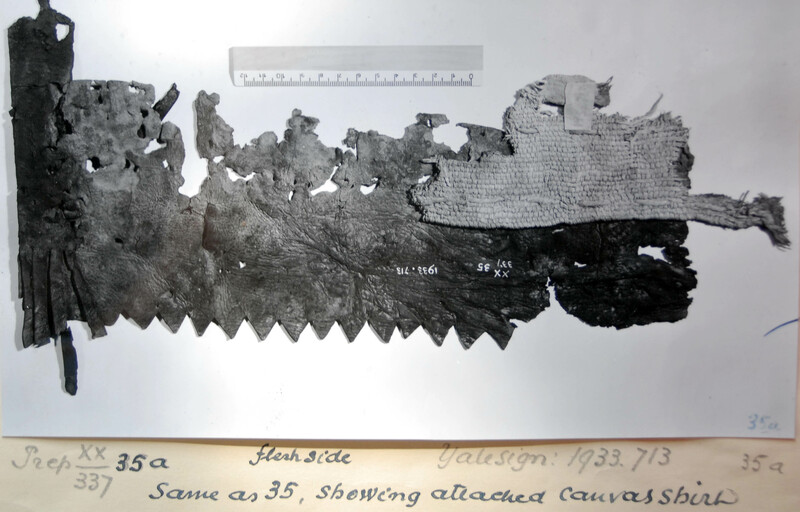 Armor of metal scales (probably bronze and not iron because of little corrosion) sewn onto a coarse textile. 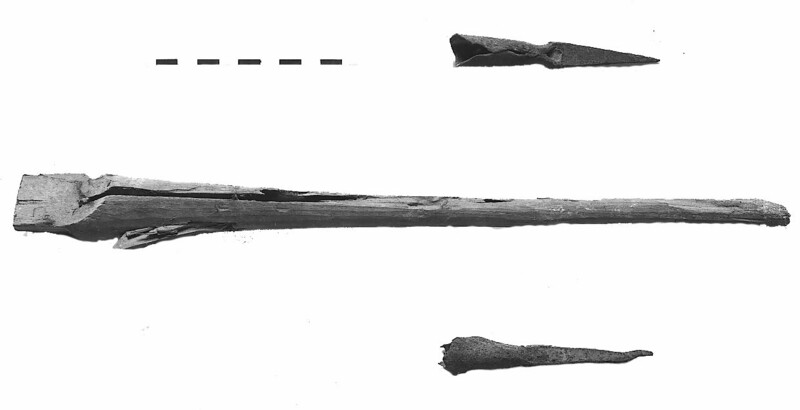 Metal points and the wooden shaft to a ballista bolt. 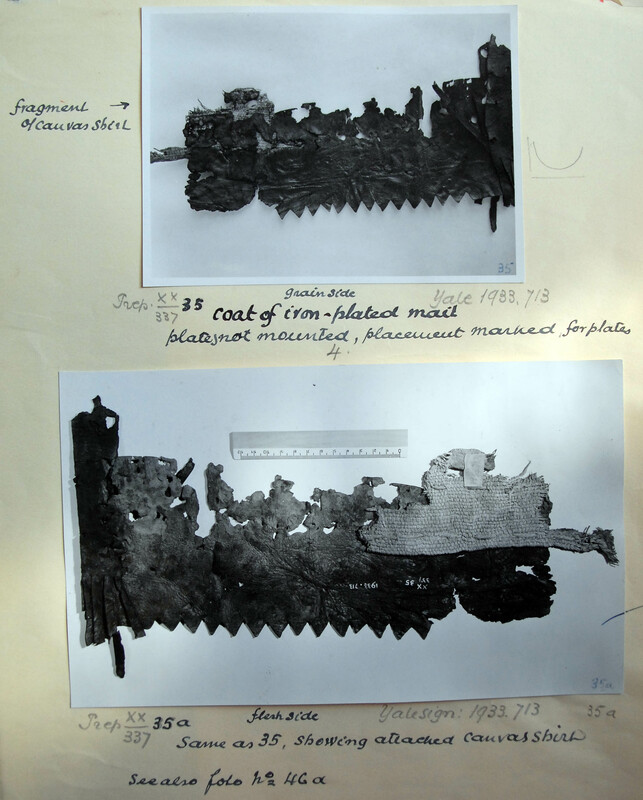 1949 The Excavations at Dura Europos Final Report IV: the Bronze Objects. Yale University Press, New Haven.